The football action this Sunday comes from the FAWNL Plate. The competition reaching the the last 4, with Milton Keynes Dons Ladies taking on Liverpool Feds Women, the prize for the winner a place in a national final. Gillingham FC Ladies play West Bromich Albion Women in the other FAWNL Plate semi-final. A Determining Round played at the start of the season to decide which FAWNL sides from a 6 divisions with play in, the winners of that game going on to contest the League Cup the losing sides entering the League Plate. Both competitions down to the last 4. Milton Keynes Dons Ladies are newly promoted to the Southern Premier Division after winning the South East Division One title last season. Beginning to find their feet at a higher level, currently 10th with 4 league wins are well clear of the bottom 2. Have saved their best form for the cup. As well as reaching the FAWNL Plate semi-finals, have enjoyed a good run in this season’s FA Women’s Cup and are once again through to the Bucks and Berks Women’s County Cup Final a competition the club has dominated in recent seasons. A bye for Milton Keynes Dons Ladies in the 1st Round of the Plate, they were away to South West Division One side Brislington Ladies in the 2nd Round, a 3-0 win seeing them safely into the 3rd Round. 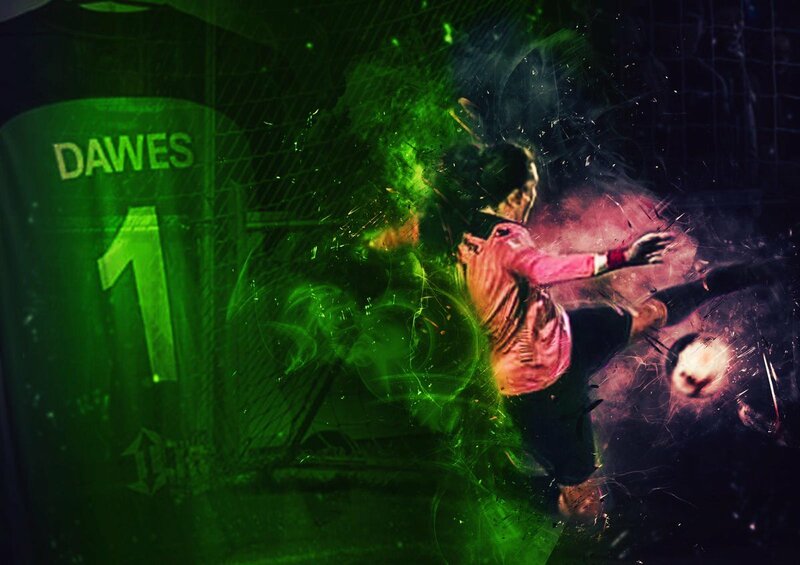 A home tie against Midlands Division One side Bedworth United Ladies needing to be settled by an extra-time winner, Milton Keynes winning 2-1. At home once more in the quarter finals, just last Sunday a tough game against promotion chasing Keynsham Town Ladies from South West Division One, Milton Keynes 2-1 down with the clock running down Amy Gooderham levelling the scores with a last gasp goal to send the tie into extra-time. No more goals the game heading into a penalty shoot-out Milton Keynes edging it 6-5 to advance to the semi-finals. Liverpool Feds Women play in the FAWNL Northern Division One currently in mid-table and into the final of their own County Cup competition. Are looking to follow in the footsteps of fellow Division one sides, Enfield Town Ladies and Luton Town Ladies in reaching their first ever National League final. Pushed Northern Premier Division leaders Blackburn Rovers Ladies all the way in the Determining Round just missing out on penalties. Into the Plate competition received a bye in the 1st Round. At home to fellow Northern Division one side Crewe Alexandra Ladies in the 2nd Round 2nd half goals from Jennifer Rogers and Demi Devereaux securing a 2-0 win. Onto the 3rd Round and another home fixture, a 3rd minute goal from Devereaux the different for Liverpool Feds as they beat fellow league side Chester Le Street Ladies 1-0 to set up a 3rd successive home tie in the quarter finals against Southern Premier Division side Middlesborough Women. 1st half goals from Jodie Mortimer and Carla Lee seeing them cause an upset against higher league opposition to reach the last 4. 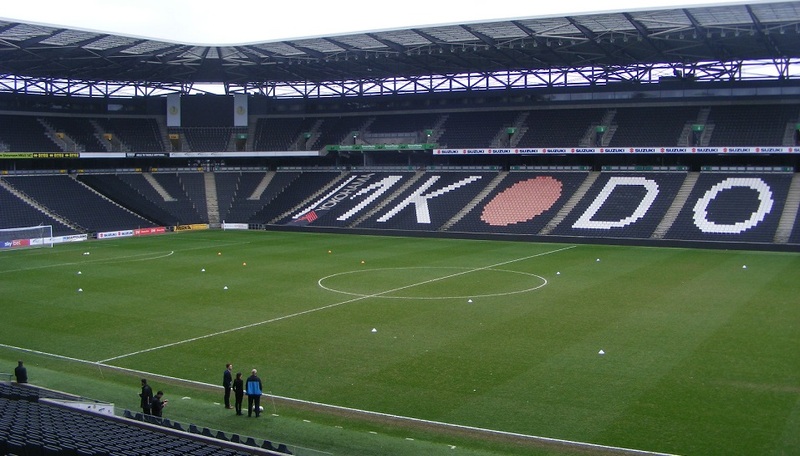 Milton Keynes Dons Ladies have from the beginning of this season played the majority of their home matches at Stadium MK itself. One of the leading football stadiums in the country aswell as hosting MK Dons the facility has hosted a number of national sporting events including England’s Lionesses. A fantastic venue to play at good for the Milton Keynes Dons Ladies as well as a great experience for all the sides visiting. A top quality playing surface and progress to let the women’s side use it on a regular basis. The weather a far cry from last weekend but that was the exception pretty much back to normal for the beginning of March, rain over night and falling for much of the journey down. Overcast and gloomy showers possible throughout the afternoon. Plenty of cover to be had inside the stadium. Milton Keynes Dons Ladies – Emma Kirby, Leanna Doyle (C), Louise Naylor, Laura Bright, Vicky Holland, Alice Hughes, Chlarizia Mia, Ellie Gough, Kerry Newman, Leah Cudone & Amy Gooderham. Subs – Sophie Shults, Charley Clarke, Sasha Newcombe, Charly Wright & Kim Farrow. Liverpool Feds Women – Meghan Pope, Rosie Kinvig, Abby Pope, Nicola James, Caroline Charlton, Jodie Mortimer, Chantelle Thompson (C), Amy Seagraves, Demi Devereaux, Jennifer Rogers & Carla Lee. Subs – Natalie Clark, Laura Bartup, Helen Griffiths, Mollie Farley & Emily Douglas. It’s Liverpool to kick-off the Plate semi-final wearing an all navy kit, with Milton Keynes lined up opposite in an all white strip with gold trim. The visitors move the ball left forced to come back inside the ball played into centre back Nicola James on halfway her forwards ball intercepted takes a deflection of the defender sending it out into the right channel into the path of Liverpool attacker Jennifer Rogers 25 yards out she takes on the shot the ball racing wide of the post. Liverpool making a positive start to the game flood forwards the ball left Demi Devereaux given the ball central lets fly from 20 yards Emma Kirby diving at her near post pushing the ball wide for a corner kick. The ball in towards the near post defended for a 2nd corner, this taken short Milton Keynes prevent the cross attempt to counter, Liverpool quick to close the ball down and regain possession. Amy Seagraves on the ball for Liverpool takes it right has Rogers ahead of her, the pair joined by full back Rosie Kinvig back up the line for Seagraves she lofts a high ball in towards the top of the area the header won by Milton Keynes’ Chlarizia Mia. Liverpool have their opponents on the back foot early on pressing the ball and quick to launch attacks. 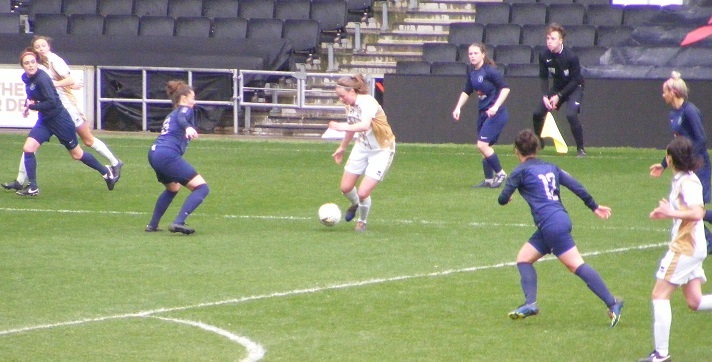 Ellie Gough with the ball for Milton Keynes drives through the middle looks to thread the ball on for Amy Gooderham leading the attack, Liverpool captain Chantelle Thompson tracking back putting the tackle in to win the ball outside the box. The visitors get hold of the ball on the middle rolled out to Carla Lee moving left drives forwards into the area shoots the ball across the keeper strikes the base of the far post. GOAL! Liverpool have dominated the play in the opening 9 minutes and the pressure exerted brings them a deserved goal. Mounting an attack on the left Devereaux chasing the ball to the byline manages to send a cross in towards goal, Kirby down at her near post the ball squeezes through her and to her dismay is over the line before it can be cleared 0-1. A sluggish start to the game from Milton Keynes the goal conceded the jolt they needed, press on from the restart the ball from Gough into Kerry Newman left side head down she drives on, Caroline Charlton coming across to support Kinvig, no way through for Newman. A throw out on the right level with the top of the Liverpool box dropped into Alice Hughes, turns pushes on into the area past two players before shooting the ball held at the near post by Meghan Pope keeping goal for Liverpool. 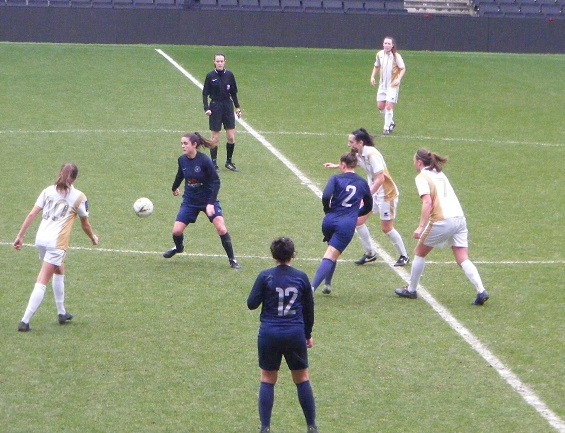 A free-kick won on halfway for Milton Keynes defender Laura Bright to play the ball up towards the top of the area, Charlton up with Gooderham winning the header for Liverpool. Gough with Newman to her left build it attack for Milton Keynes coming central, Gooderham looks to break in behind, Liverpool are quick to close down the threat. Devereaux bombing on down the left wing cuts inside unleashing a shot from outside the box, Kirby getting down making the safe gloving the ball away inside the box, no one on the follow up Bright sends it clear. Seagraves along with Thompson and Jodie Mortimer working hard to close the ball down in the middle, break up any forward momentum Milton Keynes are trying to make. Seagraves winning the ball right plays in Rogers she is fouled a free-kick awarded the delivery to the far post long over the runners. Gooderham is away after the ball into the left corner cuts inside in an attempt to get into the area Charlton doing well up against her wins it back. Play spread by Milton Keynes for Leah Cudone on the right wing, Devereaux back to support Abby Pope the pair prevent the cross. GOAL! Milton Keynes get themselves back on level term with 23 minutes gone, the goal coming from a miscued ball at the back from Liverpool, Cudone intercepting the ball put across to Newman 25 yards out left of the D, time and space to line up a shot she hits it superbly, the ball flying in over the keeper kisses the underside of the crossbar on its way in 1-1. Is an entertaining game that has certainly got the crowd buzzing a good atmosphere amongst the supporters. Liverpool push on Thompson with the ball makes ground on the left before firing an infield ball in towards Lee 25 yards out central, doesn’t get the connection with the ball she was looking for her low effort on target but lacking the power or pace to trouble Kirby. A free-kick for Liverpool inside the Milton Keynes half the ball played into the area the header seeing the ball knocked down to the right six yards out Rogers peeling away unmarked sets her sights meets it on the volley her attempt fired wide. Bright brings the ball on from the back for Milton Keynes sends it out to Newman on the left wing takes it on before sending a low diagonal ball into Gough outside the box her shot charged down by Charlton Milton Keynes beginning to exert some pressure in the final third the ball left played inside Gooderham right, Abby Pope doing enough closing her down to prevent he taking the ball on drops for Newman, she too is quickly closed down, the ball popping out to Gough he shot well over from distance. Seagraves brings the ball on right into Rogers closely marked by Naylor a clever back heel sends the ball on Seagraves after it cuts it back for Kinvig, she sends a cross from deep high into the box Lee in a central position six yards out gets her head on the ball, it loops up towards goal Kirby however can see it land on the roof of her net. GOAL! Milton Keynes turn it around to take the lead in the 38th minute, the hosts winning a penalty as Naylor winning the ball in midfield plays in on for Gooderham getting in behind takes the ball on into the box left is closed down by Meghan Pope the goalkeeper saving at close range is grounded however as the ball bounces up for Gooderham about to take it on the sliding challenge comes in and the attacker is cleaned out the referee pointing to the spot. Captain Leanna Doyle to take, a good strike sending the keeper the wrong way to make it 2-1. Rogers with the ball left in attack for Liverpool has Lee inside her, Mortimer has gotten ahead of them both inside the D, tries to set up Lee making a run t o get past her into the box, Vicky Holland wins the ball for Milton Keynes. Cudone with good work with the ball on the right comes inside lays it off for Hughes central her strike from outside the area over. Both sides press late in the first half with defences coming out on top, Holland intercepting for Milton Keynes, Kinvig closing down Newman as she threatens to get forwards. A lively contest Liverpool with a fantastic start that gave them plenty of confidence, getting the lead their play deserved. It was the wake up call Milton Keynes needed after a slow start drawing level with a fantastic strike from Newman end the half leading 2-1. A lot of energy put into the game from Liverpool closing the ball down and positive in attack creating chances. Strong challenges starting to build as the half progressed Milton Keynes frustrated at times. No changes for either side at half-time it’s Milton Keynes to get the 2nd half underway. The ball lost Liverpool get straight on the offence the ball with Devereaux on the left to the line she fires in a cross along the face of the six yard box the interception by Bright sees the ball cleared. Positive from both sides Liverpool counter Devereaux central laying the pass on for Lee she is marshalled wide left into the six yard box manages to get inside her marker take a shot the angle against her Kirby scooping it up at her near post. Cudone winning the ball right plays it inside to Gough lifted up into the area James clears for Liverpool. Devereaux with the ball left side comes central a constant threat, Holland clearing her ball into the area for a throw in. Thompson combines with Rogers on the right as Liverpool build in attack the cross squared in low Lee waiting on the penalty spot doesn’t connect with her shot. 10 minutes gone in the 2nd half and Milton Keynes make the first change of the match with Kim Farrow coming on for Gooderham in attack. Liverpool pressing the ball high up the pitch won by Kinvig on for Rogers her cross into the area for Lee, cut out by Bright for a corner kick. A good delivery into the near post defended the ball headed on across goal runs out for a throw. Milton Keynes threaten to break Farrow with Newman on the left, Liverpool get the ball back to Meghan Pope. Newman attempts to thread the ball in behind for Farrow too much weight on the ball. Rogers twists and turns with the ball getting into the box from the left looks to drill a ball in across goal, Kirby down the ball pops out of her gloves, the keeper pouncing on the ball before Liverpool can capitalise. An hour gone it’s Liverpool’s turn to make a change Rogers the player giving way on comes Emily Douglas. Seagraves on for Mortimer through the middle looks to release Lee, Bright can get across the attackers run shield the ball back to her keeper. Getting a little scrappy both sides pressing the ball now. GOAL! Liverpool level the scores in the 64th minute… that’s about all I can tell you. Who scored? Liverpool put the ball in from the left into a crowed six yard box Kirby arms up to claim it the ball pops loose what follows it a goalmouth scramble, navy and white shirts all over the place the ball finds it’s way over the line, another own goal possibly, Liverpool don’t care they have the equaliser 2-2. That’s reached the volume levels amongst the crowd, Liverpool with a good amount of travelling support. Milton Keynes get on the attack from the restart the ball left put into the box caught safely by Pope. Doyle is shown a yellow card as she concedes a free-kick. The game in danger of spilling over passion showing from both sets of players. Cudone with the ball has Newman and Mia with her getting the return pass on the right is upended by Seagraves wins the free-kick. Hughes over it long to the far post headed back into the middle Cudone first to it can’t keep her shot down. A 2nd change for Milton Keynes, Newman giving way on comes Charley Wright with 20 minutes left on the clock. Liverpool have their tails up getting back on level terms still full of energy. Holland frustrated with a decision against her on the edge of the penalty area ends up in the referees book. Put on from the left the hosts head clear. Hughes central plays it wide to Wright on the left taking it on fires the pass into the area for Farrow, good control near post turns into a shot Pope saving well with her legs the ball spinning behind for a corner. Liverpool make their 2nd change of the match Lee coming off, Laura Bartup her replacement into the final 15 minutes. Cudone in behind on the right wing on for Gough she plays the ball into the box is over Farrow central, Wright racing in behind can’t turn it goalwards. Liverpool counter the ball through the middle on for Bartup, Bright blocking her shot. Cudone coming into the middle 30 yards out Farrow ahead of her looking to make a run left to right across the D, Cudone picks her out no shot on sees Gough in space to her right sends the ball on Gough striking her shot over the crossbar. Liverpool have maintained a good tempo throughout the match and sense the game is their’s for the taking push on Mortimer into Bartup she has a go from 30 yards out a deflection sending the ball behind for a corner on the right. Into the near post Kirby coming for it just about keeps hold of it. Charlton comes on with the ball for Liverpool finds Douglas on the right Kinvig has made a great run inside her forces her way into the box unleashes a shot Kirby diving pushes the ball wide at the near post. Getting heated now into the final 5 minutes Liverpool are on the front foot late in the game, make a last change with Mollie Farley coming on for Seagraves. Farrow has made a difference since coming on for Milton Keynes seeing the ball into her feet turns and sends it on for Gough bursting into the area right the angle against her she blasts her riding shot into the side netting. Devereaux has a shot charged down for Liverpool the rebound inside box coming to Douglas to her right she slices it wide. Liverpool close the ball down high up the pitch frustrating their opponents. Cudone is fouled wide right inside the Liverpool half, Milton Keynes making a change before it is taken, Sasha Newsome on for Naylor. The ball long into the area cleared by Liverpool. Alot of stoppage time played few chances created Mortimer with a high cross into the Milton Keynes area cleared by Holland, the final whistle goes and the semi-final goes into extra-time. Both sides have made 3 changes but the new rules introduced this season mean a 4th substitute is permitted in the extra half hour of play. Liverpool with a tremendous effort to take it this far finishing the game strong, Milton Keynes to get the 1st 15 minute period of extra play underway. The ball squared into Newcombe attacking centrally for Milton Keynes she is stopped by Kinvig top of the area for Liverpool. A shot from the left from Liverpool races wide at the near post. Douglas with the ball wide on the right plays an inviting cross into the area, claimed well by Kirby with Bartup closing her down. A corner for the visitors on the left the ball delivered into the near post knocked down through the crowd, Kirby down smartly on her line to claim it. GOAL! Liverpool take the lead on the 6th minute of extra-time, Mortimer linking up with Bartup through the middle bringing the ball on Mortimer playing it through into the box with Devereaux cutting inside from the left she hits it hard and low past the keeper into the bottom corner 2-3. Cudone pressuring the ball on the right gets inside to get a shot away Pope with the easy save. GOAL! A good response from Milton Keynes to falling behind find an immediate reply the ball won back in the middle play turned around Farrow running clear in the middle into the area can’t be caught closing in on the keeper slots the shot past her and into the back of the net 3-3. Thompson fires a stinging shot into the Milton Keynes goal form 20 yards out the ball bouncing out of Kirby’s gloves her defence getting to it first. Cudone pressing right whips in a low ball missed by the defender six yards out onto Farrow quickly turns and shoots the ball wide. Bartup skims the top of the Milton Keynes crossbar with a long range strike. Liverpool with a 4th change, Helen Griffiths on for Abby Pope. Charlton doing well inside the area to shield the ball from Farrow the ball in from the right Pope down on it. 15 minutes left for one side or the other to find a winning goal or we will have a penalty shoot-out. Liverpool to get the game restarted. Cudone rushing in to claim a loose ball at the back, plays it on for Farrow a driving run is ended as Thompson gets back to defend. Players starting to go down with cramp alot of tired legs out there. Mortimer lets fly from distance Kirby dropping forwards to claim the ball. GOAL! 5 minutes into the 2nd period of extra-time and Milton Keynes get themselves in front attacking down the left Wright with the cross in towards the near post a great height for Farrow gets up and twisting her neck powers her header across the face of goal to strike the inside of the far post and in for her 2nd of the game 4-3. Devereaux wins Liverpool a corner the late goal sapping their strength the ball played into the congested six yard box Milton Keynes scramble it away. Devereaux has the legs to get forwards for Liverpool left she dives her cross/shot wide at the near post. Newcombe fouls Bartup 20 yards out in a dangerous position central. Bartup on it goes for goal Kirby gloving her attempt up into the air manages to punch it away as she’s closed down a corner won, Cudone back to cut it out. Milton Keynes break the ball with Farrow, Bartup gets back to defend Gough onto the loose ball right her cross behind. Milton Keynes Dons Ladies win the game 4-3 in extra-time to reach their first ever National Final. Coming out on top in the finish in a hard fought contest the 2nd game in a week that has gone into extra-time, penalties not needed this time. Were on the back foot for large portions of the game, frustrated by their opponents conceding early never got on top of their opponents, Farrow’s goals proving the difference in the finish. A successful weekend all round for the club with their U16 RTC making it to their 1st ever final too the FA Youth Plate. A tremendous effort from Liverpool Feds Women pushing Milton Keynes all the way to extra-time, worked hard throughout, the better side easily for large spells a good start a deserved lead, 2-1 down at the break were never out of it and getting back on level terms forced the game into extra-time just running out of steam towards the end. Backed by a buoyant and vocal travelling support they can be proud of how far they have come. Will be an all Southern Premier Division Final too with Gillingham FC Ladies beating West Bromich Albion Women 1-0 in the other Plate semi-final. They don’t get any easier it’s another tough one this Sunday in trying to pick the Women’s Football East – Player of the Match. 9 times out of 10 it will be a player from the winning side but occasionally you can’t ignore the notes, which is why today’s award goes to a Liverpool Feds player, Demi Devereaux, a constant threat throughout the game full of running, getting forwards to influence the attack, in what was a great team effort. An enjoyable trip to the Stadium MK. 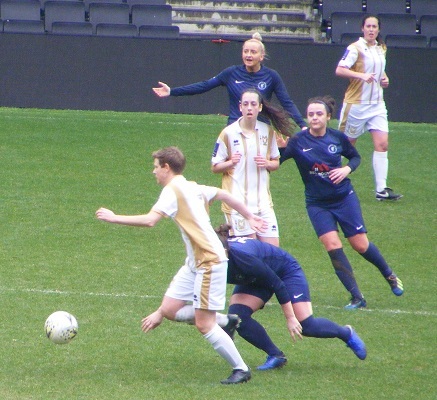 Always nice to see another side for the first time an entertaining semi-final, Kept dry a bonus my thanks for Milton Keynes for their help with the team details and congratulations upon reaching the FAWNL Plate Final. 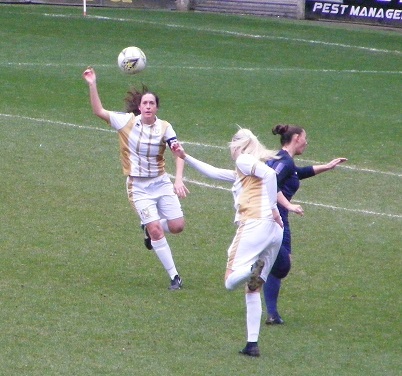 This entry was posted in FAWNL Plate, Match Reports and tagged FAWNL Plate, Liverpool Feds Women, Match Report, Milton Keynes Dons Ladies on March 4, 2019 by WFEast. It was once again another weather affected weekend across the football fixtures lists with games called off at all levels. A limited programme in the FAWNL Southern Premier Division with just the two games scheduled. 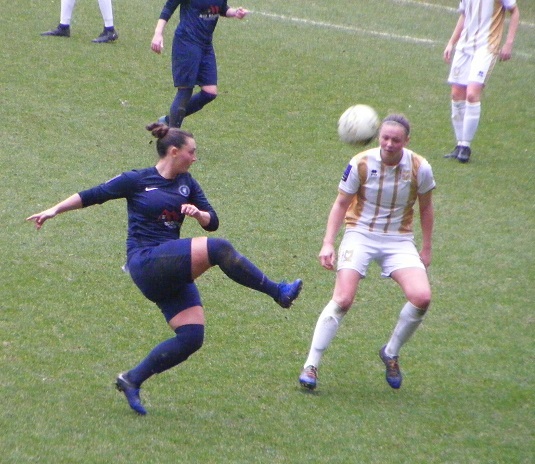 Leaders, Chichester City Ladies were looking to extend their 5 point lead at the top of the table with a win away to mid-table Oxford United Women on Sunday. The sides goalless at half-time Chichester creating the better opportunities, Oxford’s Georgia Timms seeing an effort come back off the woodwork. Lucy Thomas making some excellent saves in goal for the hosts the dead lock was broken in the 66th minute Timms’ heading the ball into the back of the net from a corner her goal proving to be enough as Oxford kept Chichester out at the other end to win their 7th game of the season. Chichester with their 3rd defeat of the campaign. Plenty of goals in the other game from the FAWNL Southern Premier Division this Sunday between Watford FC Ladies and Portsmouth FC Women. The game played at Letchworth’s County Ground a new playing surface. 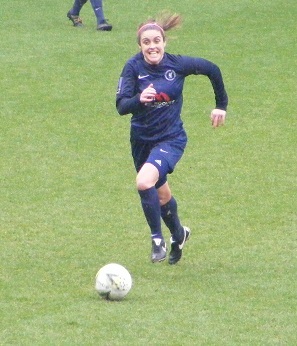 Eilidh Currie was making her 100th appearance for Portsmouth. Watford opening the scoring with Helen Ward making it 1-0 on 21 minutes, and own goal a few minutes later seeing the advantage doubled. Portsmouth reducing the deficit with a minute left of the 1st half with Shannon Albuery scoring to make it 2-1. Half-time a 2-1 lead for Watford two quick goals at the start of the 2nd period putting the hosts into a strong positing Ward getting her 2nd of the game on 46 minutes, turned assist for Leanne Bell to score just a couple of minutes later. The game far from over however as Portsmouth mounted a strong come back awarded a penalty just past the hour, Rachel Panting firing the ball home to make it 4-2, Rebecca Bath on the scoresheet for Portsmouth soon after to make it 4-3 set up a frantic finish the game in stoppage time when the visitors grabbed the equalising goal Katie James with the finish making it 4-4. Time for a winner with Watford responding straight away attacking the ball crossed along the face of goal finding Ward at the far post to tap the ball in and celebrate her hat-trick and a 5-4 victory for Watford that sees them back up to 3rd in the Southern Premier Division table. 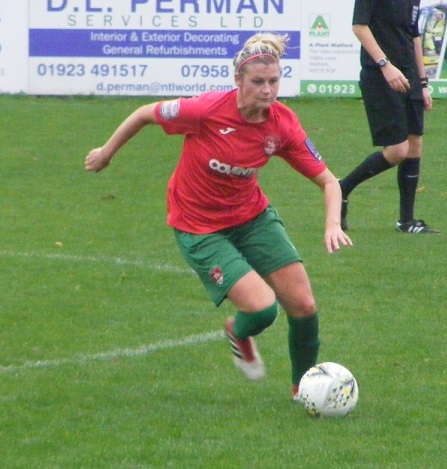 Two of the 4 games scheduled in FAWNL South East Division One beat the weather on Sunday. It was 4th at home to 2nd in the league at the weekend with Enfield Town Ladies hosting Billericay Town Ladies both sides enjoying a good season to date. Opportunities for both in the 1st half the scores remained goalless at the break. Enfield taking the lead early in the 2nd half with Eliza Diaz on target to make it 1-0. Billericay were giving a debut to goalkeeper Gemma Crowe, the Essex side responding quickly to falling a goal behind equalised and then went on to take a 2-1 lead themselves, Lindsey Morgan and Jay Blackie with the goals. Leyla Yahioglu introduced in the 64th minute to make her 1st appearance for Enfield celebrated the occasion by getting a goal with 10 minutes remaining to level the scores and see the sides share the points. Is a tight race in the top half of the FAWNL South East Division One 5th placed Leyton Orient WFC with a chance to climb up into 3rd spot themselves if they could secure the win at home to struggling Denham United Ladies on Sunday. Both keepers called into action Leyton Orient saw a Sophie Le Marchand effort ruled off for offside. Denham proving hard to break down took an early lead in the 2nd half with Meila D’Santos finding the bottom corner to make it 1-0 the visitors going 2-0 to the good with Emma Kern’s effort trickling over the line in the 55th minute. Denham working hard to keep their lead and win for just the 2nd time this season the 3 points much needed applying a little bit of pressure to the sides above. One game from the quarter finals of the FAWNL Pate competition this Sunday with Southern Premier Division side Gillingham FC Ladies away to Stevenage Ladies from South East Division One. Stevenage having a few missing through injury including captain Paige Logie who has unfortunately suffered an ACL injury that will see her ruled out for the rest of the season. Despite thier injury problems Stevenage started the game well but against the run of play Gillingham took the lead scoring in the 23rd minute. An over the top ball seeing Gillingham double their lead, a 3rd goal coming early in the 2nd half Gillingham going on to win the game 4-0 to book their place in the last four. Will be joined in the hat by West Bromich Albion Women who were 1-0 away winners against Barnsley Ladies this Sunday and Liverpool Feds Women from Northern Division One who beat Northern Premier Division side Middlesborough Women 2-0. Milton Keynes Dons Ladies are at home to Keynsham Town Ladies this coming Sunday in the last Plate quarter final. This entry was posted in FAWNL Plate, FAWNL South East Division One, FAWNL Southern Premier Division, The Round-Up and tagged FAWNL Plate, FAWNL South East Division One, FAWNL Southern Premier Division, The Round-Up on February 12, 2019 by WFEast. With the sides from the FAWNL Southern Premier Division entering the FA Women’s Cup this Sunday there was a severely reduced fixture list elsewhere with just the two matches taking place, one league game aswell a a single tie from the 3rd Round of the FAWNL Plate. A place in the quarter finals up for the taking, Ipswich Town Women were hosting Stevenage Ladies for the 2nd successive Sunday. The first in the league Ipswich edging a very close game winning by a single goal scored by captain Kerry Stimson. Meeting this Sunday in the FAWNL Plate the 2 sides enjoyed another close encounter drawing 0-0 at half-time, it was Ipswich who were to take the lead going 1-0 up on the hour with Natasha Thomas firing the ball home. It looked as if a single goal was going to be enough again as Stevenage pressed for the equaliser the game heading into stoppage time up popped Ashleigh Deacon to score a last gasp leveller to force the tie into extra-time. The visitors taking the lead early in the extra period of play, Ellie Searle getting the goal to make it 2-1, would prove to be the winning goal as Stevenage booked their place in the last 8 of the Plate competition. One league game this Sunday in FAWNL South East Division One, mid-table Actonians Ladies hosting 2nd bottom, Denham United Ladies. Alessandra Barreca scoring her 10th goal of the season on the half hour for Actonians a flurry of goals was to follow at the end of the first half half to see the hosts take an iron grip of the game, Barreca netting her 2nd in the 38th minute, goal from Sara Lopez Ezzahiri and Enya Collins on the 44th & 45th minute seeing Actonians get 4 on the board. Sharon Odofin making her first start of the season scored her 1st goal too 8 minutes into the 2nd half, Actonians going on to win the game 5-1. Holly Nicholls with the goal for Denham. The win for Actonians, seeing them pull away from the sides at the bottom of the table and close the gap to the sides above in contention now for an assault on the top half. This entry was posted in FAWNL Plate, FAWNL South East Division One, The Round-Up and tagged FAWNL Plate, FAWNL South East Division One, The Round-Up on December 4, 2018 by WFEast. A county cup weekend this Sunday meaning clubs from the FAWNL and ERWFL had fixtures elsewhere, leaving the fixture list across the league light. 6 games taking place across both the Southern Premier Division and South East Division One aswell as the Plate competition. A big win at the top of the Southern Premier Division as leaders, Coventry United Ladies open up a 4 point lead at the top of the table beating their closest rivals Watford FC Ladies or the 2nd successive Sunday. In the 2nd Round of the FAWNL Cup a week ago Coventry securing a 3-2 win away from home against Watford to progress. Were at home this Sunday facing Watford again this time in the league . Amber Hughes striking from outside the box putting Coventry into the lead scoring midway through the 2nd half, the home side awarded a penalty with Jade brook fouled inside the box. Chenise Austin scoring from the spot kick to double Coventry’s lead. 2-0 at half-time the hosts extending the lead just past the hour Marie Gauntlett getting on the scoresheet scoring from a free-kick. Closing in on the final 15 minutes Amy Wathan played through on goal sending the ball past the keeper to see Coventry secure a 4-0 win. 10 wins in a row now for Coventry. Watford down a place to 3rd in the Southern Premier Division on the back of that result with Chichester City Ladies fine start to the continued on Sunday a 6th league win of the season seeing them up to 2nd on goal difference. Were away to Queens Park Rangers Women. A devastating 10 minute spell in the 1st half seeing the visitors storm into a 3 goal lead. Hollie Wride scoring the opening goal on 12 minutes, Jade Widdows doubling the advantage just 4 minutes later. Cherelle Khassel making it 3 in the 22nd minute. QPR pulling it back to 3-1 just before half-time Jo Wilson netting the goal. QPR fought well in the 2nd half as the Chichester City defence held firm, Chontele Lawrence getting it back to 3-2 for the hosts the goal in stoppage time Chichester City holding on for the 3 points. Two 2nd Round ties played in the FAWNL Plate this Sunday. Milton Keynes Dons Ladies progressing with an away victory over South West Division One side Brislington Ladies. Postponed due to the wet weather last Sunday the Southern premier Division side took an early lead in the match with Leah Littlechild scoring in the 5th minute. Leah Cudone making it 2-0 7 minutes later. Alice Hughes putting MK Dons 3-0 in the 35th minute to see them comfortable with a 3-0 lead at the break. No more goals 2nd half with MK Dons defending their lead Brislington unable to find a reply. Portsmouth FC Women were waiting to see who their opponents would be in the 2nd Round of the Plate with Keynsham Town Ladies playing fellow South West Division One opponents Southampton Saints Girls & Ladies in the 1st Round. Keynsham Town 2nd in the league advancing to set up a home tie with Portsmouth. The sides level at 1-1 at half-time Kerry Bartlett’s 39th minute equaliser cancelling out Katie James 11th minute goal for Portsmouth. 1-1 it remained heading into stoppage time, Ellie Curson finding the back of the net to see Keynsham Town win the match and knock Portsmouth out. The draw for the 3rd Round of the FAWNL Plate, as well as the Cup made yesterday both draws listed below:- Ties scheduled to be played Sun 9th December. Two games in the FAWNL South East Division One this Sunday and with leaders Crawley Wasps Ladies involved in County Cup action 2nd placed Billericay Town Ladies took full advantage winning at home to go top of the table. Their opponents Enfield Town Ladies. It was the 5th placed side that opened the scoring however with Molly Peters running clear to score in the 17th minute. Billericay pulling the scores back level with 6 minutes left on the 1st half Zoe Rushen scoring from close range. Enfield responding well getting themselves back into the lead 3 minutes later, Jodie Southby with her 1st goal of the season putting the visitors 2-1 up. Still time for more drama in the 1st half as less than a minute later Billericay were back level, Rushen again making the near post run and beating the keeper to score. No sooner had the hosts levelled the scores for the 2nd time they went on to take the lead, Rushen on target to complete her hat-trick and see Billericay end the 1st half 3-2 up. No further goals coming 2nd half Billericay returning to the top of the South East Division One table. 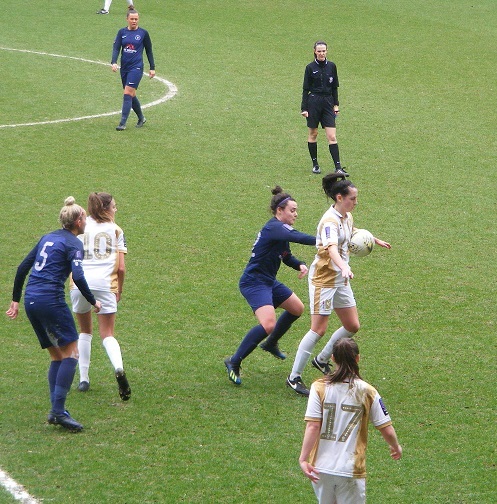 AFC Wimbledon Ladies were away to Stevenage Ladies on Sunday, Rebecca Sargent’s scoring in the 20th minute the difference between the sides at the half-time interval. Stevenage coming back to level the scores 10 minutes into the 2nd half. Jodie Whitford-Stark scoring her 1st Stevenage goal. A screamer from Katie Stanley in the 69th minute restoring AFC Wimbledon’s lead the visitors holding on to claim the 3 points and climb up a couple of places to 7th in the South East Division One table. This entry was posted in FAWNL Plate, FAWNL South East Division One, FAWNL Southern Premier Division, The Round-Up and tagged FAWNL Plate, FAWNL South East Division One, FAWNL Southern Premier Division, The Round-Up on October 23, 2018 by WFEast. A break from the league this Sunday as the FAWNL Cup and Plate competitions enter the 2nd Round a place in the last 16 up for grabs. 8 2nd Round ties in the Cup featuring sides from the Southern Premier Division and South East Division One. Sunday was a very wet day heavy rain overnight on Saturday with more falling for much of the day, Postponements everywhere and the FAWNL Cup no exception seeing two 2nd Round ties called off, Southampton Women v Plymouth Argyle Ladies and Cambridge United Women v Leyton Orient WFC the casualties. 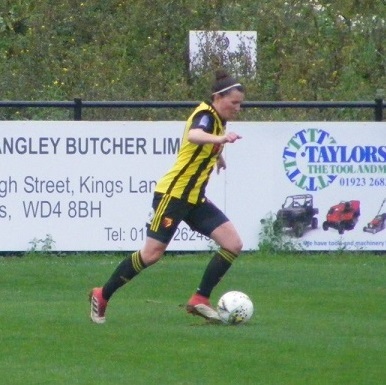 The other taking place in rather damp conditions, it was the 2nd Round of the FAWNL Cup where the action from the Women’s Football East match report came from a trip down to Hertfordshire to watch Watford FC Ladies v Coventry United Ladies. A clash between the top two in the Southern Premier Division, Coventry United Ladies top by a point unbeaten. Watford FC Ladies with just the one loss. Coventry getting off to the better start, Weronika Baronowska making a couple of vital saves for Watford their goal breached in the 20th minute, the ball falling to Marie Gauntlett outside the box a left foot half volley striking the ball into the back of the net. Susan Wood at the other end with a crucial save with her legs to deny Linda Afuakwah from finding the equaliser. Coventry 1-0 to the good at the break. The majority of Watford’s goals however have come in the 2nd half, not out of it at all although they fell behind soon after the restart Amber Hughes inside the box looping a cross in to drop in front of goal Lois Jefferies there to nod the ball in from close range. Watford attacking 2nd half were to get a goal back with Katie O’Leary sending Helen Ward through on goal to score. Coventry playing the ball well through the middle good build-up seeing Jade Brook with the ball 30 yards out right side took on the shot a brilliant effort flying up and over the keeper to land inside the net caught by the stanchion. Leading 3-1 Watford kept going and stretching the visitors at the back O’Leary racing in on goal met a right wing cross the ball dropping down off her to roll in off the post. A tense finish but Coventry held onto their goal advantage to win and progress into the next round. A bit of controversy in the other 2nd Round FAWNL Cup tie featuring an all Southern Premier Division line-up. Queens Park Rangers Women not happy with the refereeing decisions as they were knocked out of the competition through to late goals from visitors Loughborough Foxes Women. It was QPR Women who held the advantage at half-time Jo Wilson netting the home sides goal in the 34th minute. 7 minutes into the 2nd half and Loughborough got the equaliser awarded a penalty, Laura Steele sending the ball into the back of the net. 5 minutes left and Loughborough took the lead Eva Rogers with the goal to make it 2-1 QPR goalkeeper Gillian Kasirye injured in the same incident QPR protesting, Courtney Ward-Chambers shown a red card for dissent and Kasirye unable to continue the hosts down to 9. Loughborough going on to add a 3rd goal deep into stoppage time with Rebecca McGrother on target. Oxford United Women were hosting South East Division One leaders Crawley Wasps Ladies in the 2nd Round of the FAWNL Cup. Goalless at half-time, a rocket from Sophie Baker saw the Southern Premier Division side take the lead in the 52nd minute. The game almost up it looked like Crawley’s 100% record at the start of the season was finally over, into stoppage time and a free-kick awarded to the visitors Naomi Cole scoring from it to make it 1-1 and send the game into extra-time. The visiting side having the better of the extra period of play Emma Plewa scoring to put Crawley in front with 3 minutes gone Sian Heather on target to make it 3-1 7 minutes later. Crawley advancing in the FAWNL Cup with an extra-time win. Extra-time too needed for AFC Wimbledon Ladies in the 2nd Round of the FAWNL Cup the South East Division One side on the road playing Larkhall Athletic Ladies from South West Division One. Larkhall taking the lead in the 30th minute, Wimbledon hitting back just 4 minutes later to level Katie Stanley making it 1-1. Honours even at half-time it was Wimbledon with the better start 2nd half getting into the lead Caroline Bisson scoring the goal in the 47th minute. That the score closing in the final 10 minutes Larkhall getting themselves back on level terms 2-2 after the 90 the game heading into extra-time. Captain Jess Trimnell the hero in extra-time scoring what would prove to be the winning goal to send Wimbledon through. Katy-May O’Hara Nash and Mel Sartain with the goals for Larkhall. 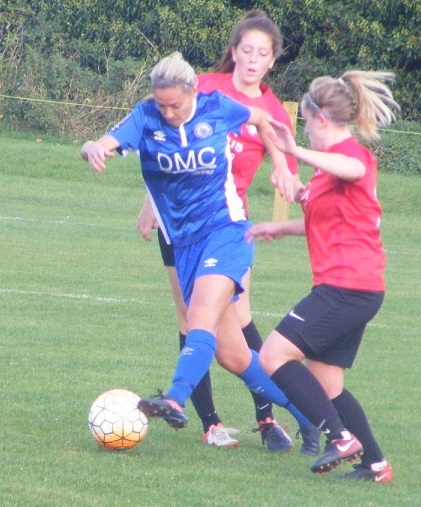 South Premier Division side Cardiff City Ladies were at home in the 2nd Round of the FAWNL Cup taking on South West Division One side Cheltenham Town Ladies. The lower league side getting off to a great start scoring inside the opening 3 minutes Ella Hitchcox through on goal to make it 1-0. Cardiff back on level terms in the 18th minute Grace Horrell getting hold of the ball to score to make it 1-1 the home side leading midway through the 1st half Kylie Nolan slotting a rebound home. A 2-1 lead for Cardiff at half-time. Nolan scoring her 2nd of the game a minute after the 2nd half whistle to make it 3-1 to Cardiff. Into the final 10 minutes and Hitchcox scores her 2nd of the match to bring it back to 3-2. 3 minutes left and Cheltenham are level Annie Martin with the goal to make it 3-3. A corner to Cardiff in the final minute Cori Williams getting her head on the ball to put Cardiff back into the lead then deep into stoppage time Williams on hand from another corner to score and see Cardiff win the game 5-3. South East Division One side, Billericay Town Ladies, 2nd in table were hosting Chichester City Ladies in 4th spot in the Southern Premier Division in the FAWNL Cup 2nd Round. Billericay giving a good account of themselves coming close to taking the lead Zoe Rushen seeing a shot hit the bar, Chichester finding the winning goals late on into the last 15 minutes Holly Wride giving the visitors the lead with Molly Clark making it 2-0 to Chichester in the final minute to see them through to the next round. Also the 2nd Round of the FAWNL Plate this Sunday. 5 scheduled games featuring sides from the Southern Premier and South East Division One. Milton Keynes Dons Ladies game away to Brislington Ladies falling foul of the weather. A switch of venues saw Maidenhead United Ladies and Denham United Ladies play their 2nd Round tie. It was the South West Division One side who opened the scoring Anie McKeever making it 1-0 to Maidenhead. Denham United coming back to level the scores with 5 minutes left on the clock Rachel Keightley scoring the goal to force the game into extra-time. No more scored in the extra period of play the game headed into a penalty shootout, Denham not scoring from their 1st to, Maidenhead did to go on a clinch a 4-2 shootout win to progress. South East Division One side, Actonians Ladies fell foul to an injury time winner to exit the FAWNL Plate. Were hosting South West Division One side, Chesham United Ladies. The visitors getting the opening goal with Emma Delves on target in the 17th minute. 1-0 up at half-time, Carla Williams getting Actonians back level making it 1-1 midway through the 2nd half. Deep into stoppage time Chesham found the winner, Gemma Fraser putting the ball home to see the visitors celebrate. Luton Town Ladies made it all the way through to the FAWNL Plate final last season, there 1st national final appearance. In the 2nd Round of the Plate this time they were drawn away to Southern Premier Division side, Gillingham FC Ladies. The hosts taking the lead in the game 1-0 inside the opening 10 minutes. Gillingham hitting a purple patch with 33 minutes played scoring 3 goals in 6 minutes to go 4-0 up, Breon Grant, Alice Bussey and Emma Sherwood with the goals. 4-0 up at half-time a harsh scoreline for Luton the visitors fought back well in the 2nd half. Jess McKay pulling a goal back in the 47th minute Gillingham hitting back straight away Sherwood with her 2nd of the match making it 5-1. Captain Rachel Carter scoring in the 52nd minute. McKay with her 2nd of the game on 67 bringing it back to 5-3. A tense final 10 minutes to the match as Aurora Ryan grabbed a goal to make it 5-4. Gillingham holding to knock Luton out and progress in the competition. Ipswich Town Women were at last finding a bit of form coming in to this Sunday’s FAWNL Plate tie the South East Division One side hosting Southern Premier Division side, C&K Basildon Ladies. A few ex-Basildon players in their ranks Ipswich took the lead in the 15th minute Zoe Cossey with the strike. Natasha Thomas scoring to make it 2-0 to the hosts with 7 minutes of the 1st half left. 2 more goals right at the end of the 1st half giving the hosts a comfortable lead, Toni-Anne Wayne scoring her 1st goals for Ipswich a minute apart. Ipswich defending their 4 goal lead until deep into stoppage time where C&K Basildon managed to pull in back to 4-2 but it was too little too late as Ipswich go through. This entry was posted in FAWNL Cup, FAWNL Plate, The Round-Up and tagged FAWNL Cup, FAWNL Plate, The Round-Up on October 16, 2018 by WFEast. Five straight league wins for Coventry United Ladies now takes them back to the top of the FAWNL Southern Division. Unbeaten in 7 at the start of the season. At home on Sunday taking on C&K Basildon Ladies, goals from Amber Hughes and Jade Brook seeing Coventry start strongly 2 up after 10 minutes. C&K Basildon pulling a goal back before the half-time interval. Brook with her 2nd of the game restoring Coventry’s 2 goal cushion on the hour. Amy Wathan scoring in the last 10 minutes to see Coventry record a 4-1 win to move top ahead of Watford FC Ladies. Losing to Coventry a fortnight ago Chichester City Ladies unbeaten start to the season came to an end last weeks fixture at home to Cardiff City Ladies falling foul of the weather, Chichester were on the road this weekend back in league action taking on Loughborough Foxes Women. A tight game the sides contesting a goalless first half, Chichester striking early 2nd half Molly Clark on 47 minutes scoring what would prove to be the winning goal, Chichester in 3rd keep the pressure on the leading pair. Plymouth Argyle Ladies impressive start to the season continues the South West Division One Champions now up to 4th in the Southern Premier Division table after they won for the 4th successive game. Were on the road taking on Queens Park Rangers Ladies. Helen Bleazard with a 1st half double handing Plymouth a 2-0 half-time advantage, they didn’t have it all their own way 2nd half, QPR fighting back with 2 quickfire goals to level the scores, new signing Whitney Locke scoring her 1st goal for the club on 65 minutes, Rochelle Shakes also newly arrived making it 2-2, 4 minutes later. Plymouth coming back to retake the lead and go on to win the game Zoe Cunningham finding the back of the net to make it 3-2 with 7 minutes left. A 2nd league win in the Southern Premier Division for Milton Keynes Dons Ladies as the newly promoted side winning South East Division One start to find their feet in the league. 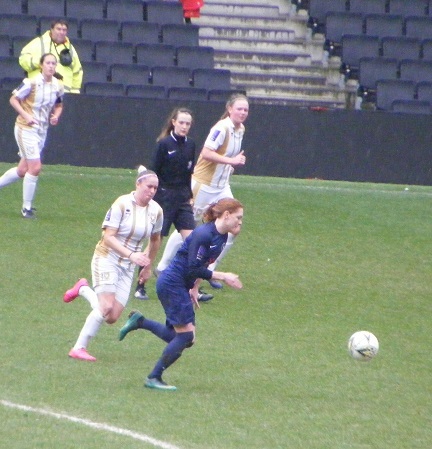 At home on Sunday at Stadium MK up against Gillingham FC Ladies. 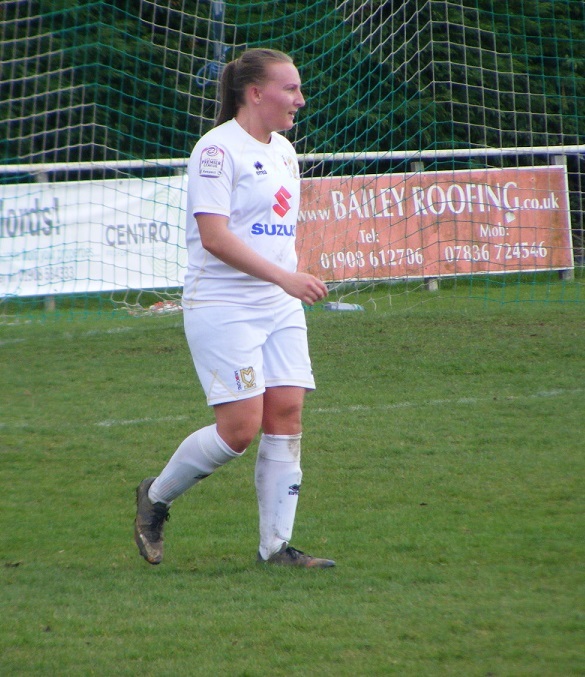 Another close contest 0-0 for 75 minutes, the winning goal was struck home by Kim Farrow for Milton Keynes Dons in the 76th minute to win them the 3 points moving them onto 7 points after 7 played. This weekend saw the 1st Round’s of the FAWNL Cup and Plate taking place, a handful of ties in both competitions with most handed a bye to the 2nd Round. Two 1st Round Cup matches featuring South East Division One sides, AFC Wimbledon Ladies were at home taking on Buckland Athletic Ladies from the South West Division One. Bernice Tully with her 1st goal for AFC Wimbledon giving the hosts a 21st minute lead Laura Quinn-Low also scoring for the 1st time this season seeing AFC Wimbledon leading 2-0 at half-time. Jenny Nagle another scoring her 1st goal for AFC Wimbledon to put them 3 up midway through the 2nd half. 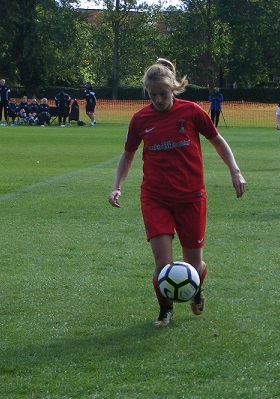 Georgia Heasman in her 1st game back in Wimbledon colours adding a 4th goal with 5 minutes left. Was a 7 goal thriller in the FAWNL Cup 1st Round tie on Sunday, South East Division One side, Enfield Town Ladies hosting, Southampton Women of South West Division One. Nuala McKevitt putting Enfield 1 up within 6 minutes of the start. Southampton coming back equalised through Kayleigh Tonks in the 22nd minute the visitors taking the lead late in the 1st half Natalie Bavister on target. 2-1 the lead for Southampton, Jane Yates gave them a 3-1 lead scoring 2 minutes into the 2nd period. Enfield’s turn to fightback, Sara Degooye pulling it back to 3-2 five minutes later. Molly Peters scoring to see Enfield level it at 3-3 with 15 minutes left. The winning goal coming 3 minutes from the end of normal play, Roxanne Lee-Stewart with Southampton’s 4th and winning goal. In the FAWNL Plate 1st Round, Southern Premier Division side, Portsmouth FC Women were away to Poole Town Ladies from South West Division One. The higher league side proving too strong, Katie James putting Portsmouth into the lead inside 10 minutes. Carla Perkins adding a 4 minute brace with Eilidh Currie making it 4-0 to Portsmouth midway through the 1st half. More goals coming for the visitors 2nd half, Rachel Panting striking early going on to complete a hat-trick. Hannah Geer also scoring with Perkins also adding a 3rd goal to complete her own hat-trick a 9-0 victory seeing Portsmouth progress. A thriller for the neutral at the top of South East Division One on Sunday with 3rd placed Actonians Ladies hosting 2nd placed Billericay Town Ladies. An early goal for Jennifer Laidlaw along with a goal for Sara Lopez-Ezzahiri for Actonians in the 1st half they found themselves trailing however with Billericay on target for 3 goals up the other end the visitors adding a 4th goal 2nd half, Actonians hit back to earn a point with Enya Collins and Carla Williams striking to see the game finish 4-4. 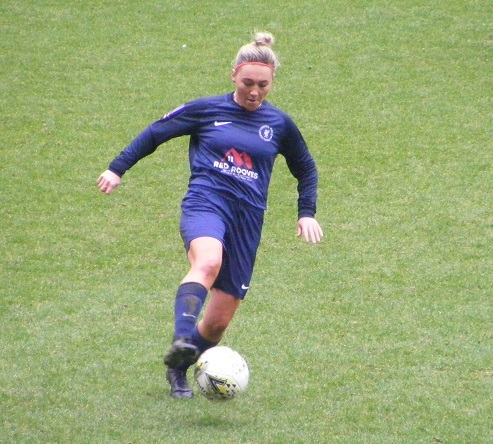 Billericay’s 100% winning start coming to an end the point nevertheless enough to put the into top position with Crawley Wasps in cup action at the weekend. Teams clustering below with just 2 points between 4th and 10th in the South East Division One table. Stevenage Ladies moving up into the top half of the table following their 2nd league win of the season on Sunday coming on the road away to Norwich City Ladies, goals from Shona Chitate and Ashleigh Deacon seeing Stevenage hold a 2-0 advantage at half-time. Norwich saw a penalty saved in the 2nd half before pulling a goal back with Laura Thacker making it 2-1. The visitors holding on for the 2-1 win. A first league win of the season in South East Division One for bottom side Luton Town Ladies. At home on Sunday taking on Ipswich Town Ladies. The visitors taking the lead however Paige Wakefield putting Ipswich in front. Dionne Manning scoring a brace brought Luton back on level terms then gave them the lead. Jess McKay scoring to make in 3-1 and see Luton collect their 1st league points of the season. This entry was posted in FAWNL Cup, FAWNL Plate, FAWNL South East Division One, FAWNL Southern Premier Division, The Round-Up and tagged FAWNL Cup, FAWNL Plate, FAWNL South East Division One, FAWNL Southern Premier Division, The Round-Up on October 2, 2018 by WFEast.